Are you a mechanical engineer with a particular interest in the rapidly developing field of the maintenance of technical systems? Are you as fascinated by the technical aspects of optimizing maintenance as you are by aspects such as reliable system, process design, lifecycle management, condition monitoring and safety or supply chains? 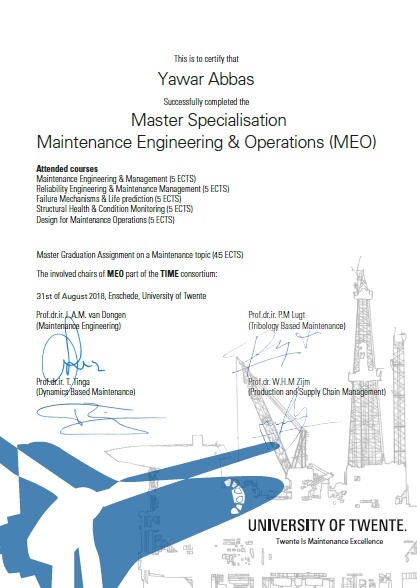 If you are, the Master’s specialization Maintenance Engineering & Operations (ME&O), one of five tracks you can choose from within our Master’s programme Mechanical Engineering (ME), is the perfect choice for you. What does it take to ensure the availability, reliability and cost-effectiveness of technical systems? How can we analyse failure behaviour and improve performance by (re-)engineering and optimizing maintenance strategies and concepts? How can we use new technologies to monitor an installation’s structural health and condition and optimise the resources required for maintenance? Or to extend the lifecycles of assets, thus improving their economic performance and sustainability? These are typical questions you will tackle in the Maintenance Engineering & Operations track. The ME track Maintenance Engineering & Operations will deepen and broaden your knowledge of the analysis and maintenance of machinery, structures and production facilities. It deviates from the other four ME specializations, Design Production & Management, Biomechanical Engineering & Robotics, Mechanics of Solids, Surfaces & Systems, and Thermal and Fluid Engineering, which are more traditionally discipline oriented. The ME&O track rather on a specific application area, namely maintenance and asset management of technical systems. In this track you will learn to improve maintenance by making use of research into design methods, physical mechanisms and predictive maintenance, structural health and condition monitoring, asset management and reliability engineering. As a Maintenance Engineering & Operations specialist, you will have the tools to engineer innovative maintenance solutions, both in the design phase and operational phase of a technical facility. On top of that, you will be equipped to take part in decision-making regarding maintenance activities for technical installations aimed at improving the overall performance of the system and the company. ✓ Our Master’s in Mechanical Engineering is one of the very few in the world in which you can specialize in ME&O at this most advanced level. As an ME Graduate with this specialization, you will likely be among the world’s leading pioneers in the rapidly changing world of maintenance. ✓ Taking the ME&O track at the University of Twente will give you a head start in your career, as it will expose you to some of the very best and latest research in this field. In Intelligent Manufacturing Systems, for example, the UT is a leading international player and the go-to institute in the Netherlands, with an outstanding position in key domains, such as predictive maintenance, production technology, ICT, supply chains and business modelling. ✓ Some 30 to 50% of ME students taking the ME&O track are non-Dutch. This international student base means you will work on projects with people from many different cultures and countries – an excellent way for you to prepare for your career in this highly internationalized field. ✓ The UT was acclaimed in 2017 as the best university of technology in the Netherlands, while in the overall ranking we joined our country’s top three universities. Not only will you benefit from our campus’ world-class facilities, but also from our pioneering, cross-disciplinary research in many fields. At the UT you will develop a strong engineering mind-set that will equip you to tackle complex challenges. Your graduation project, which will be an assignment for an industrial player combining research and problem-solving. Naturally, you are free as a Master’s student to come up with your own graduation project proposal. As a university that places a strong emphasis on societal impact and valorisation, we require our Master’s students to choose graduation projects in which they combine fundamental research with practical application in a real-world industrial setting. In the Mechanical Engineering Master’s projects are carried out with and for leading corporations, ranging from NS, ProRail, Strukton Rail, to Fokker, Thales, KLM, Schiphol Airport, Siemens, Bosch, Shell, Tata Steel and many others in several industrial sectors. Because of the different angles you can take to look at maintenance engineering, , the range of thesis research topics is huge and can involve any of the domains in which you will have taken courses. On completing the Master’s programme in Mechanical Engineering, you will receive a Master of Science degree and a special certificate attesting your deep knowledge in Maintenance Engineering. Employees in industry will attach a lot of value to your specialized expertise. At the same time, you will meet all the requirements of a qualified Mechanical Engineer and be equipped to enter any area of mechanical engineering – not just the area of your Master’s specialization. Demand for mechanical engineers is huge. As a Master’s graduate from the UT you will be amply qualified to work in a wide range of companies in a variety of positions. Many graduates find jobs in research & development or design & construction. In design teams, they take on the role of engineering specialist, integrator and they often serve as team leaders. A relatively high number of them to manage other engineers in their first job. As companies today are increasingly on the lookout for maintenance and reliability engineers, on an academic level, your career prospects will be excellent. Maintenance is a multidisciplinary field and you will find job opportunities in almost every industry as an expert in reliability engineering, predictive maintenance, after-sales service logistics or asset life cycle management.